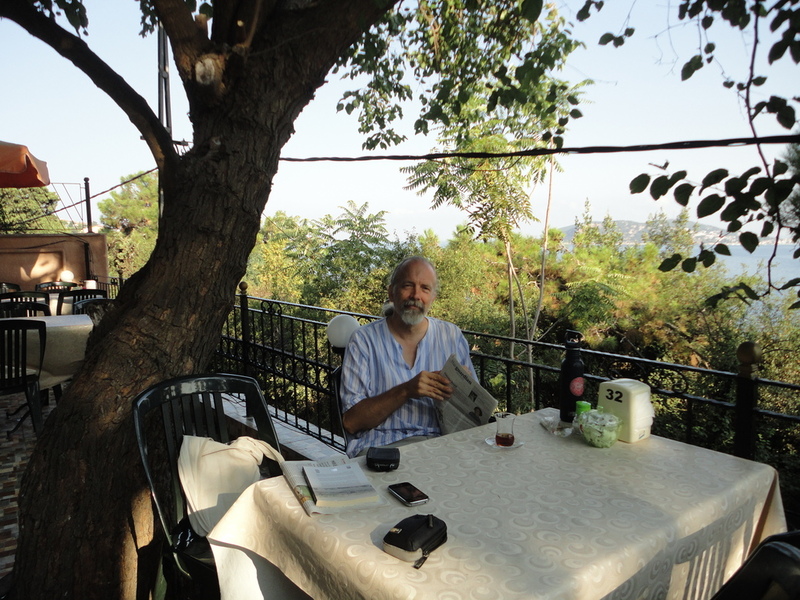 The Turkish name of this island is Burgazada, and I discussed its etymology in an article about a visit in February of 2014. We stayed there again in October of 2015. During this August of 2016, on our last day on the island, I saw a fellow with the Greek name of the island tattooed on his forearm. I suppose he was a proud native son. As far as I could tell though, the ink under his skin spelled out not exactly Αντιγόνη, but Αητιρθηι. I can only speculate on whether the Greek letters were being used merely according to shape, to give an exotic appearance to the Romanized form Antigoni (which is now the name of a restaurant on the island). I recall political cartoons about the Soviet Union in which the Latin letter R is replaced with the Cyrillic Я. More recently, there was a satire about Chinese young people getting tattoos of supposedly English words like frunk and crymph, the way young people ignorant of Chinese may nonetheless get Chinese tattoos. Perhaps Peter Mehlman effectively foretold this trend in the Seinfeld episode The Chinese Woman. The tattooed forearm on Pyrgos Island would be seen at Four Letter Word Coffee. This was where we went on alighting from the ferry around 11:30 on Tuesday, August 9, 2016. We had escaped from our flat in town, where the radiators were to be replaced. It was good that this work was going to be done. At least it was good that, along with the radiators, we were getting our own furnace. 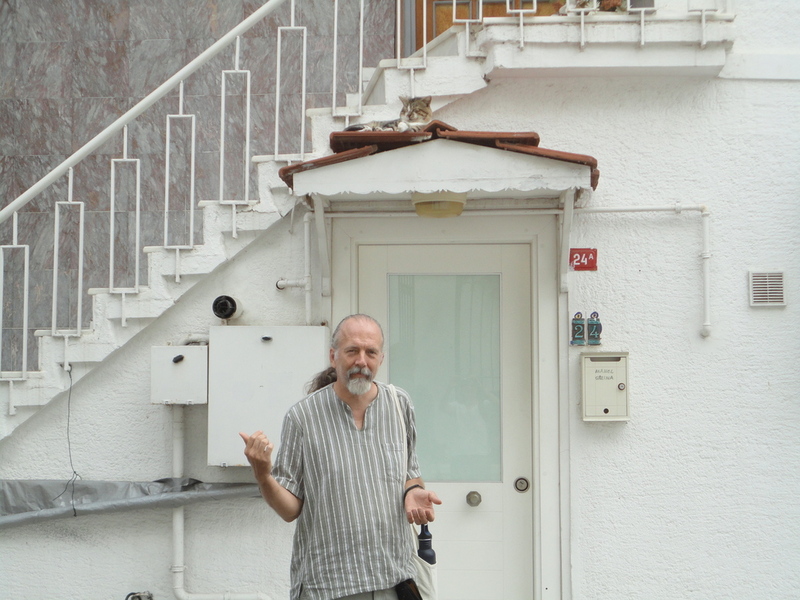 In five winters in Istanbul, our apartment building had burnt up too much gas from Iran and Russia so that residents could sit around in tee-shirts, if they happened to be at home in the first place. Our building had central heating, and nobody ever asked us where the thermostat should be set. Top-storey flats like ours are supposed to be the coldest, being farthest from the furnace in the basement, and being beneath a poorly insulated roof; but Ayşe and I would turn off most of our radiators. Now the owners decided to give each flat its own furnace. This may have been required by law, to prevent the waste that I have just complained about. It is the government that has to maintain decent relations with the gas-producing neighbors. In any case, though the new system would be good, it meant a bunch of workers would make a mess of our flat. We were supposed to buy plastic sheets, so that the workers could cover up our stuff after they gathered it in the center of each room. But would the workers then put our stuff back where it had been, undamaged? We could not be too sure. At least I could feel proud of myself for having saved the boxes for our home entertainment system and video screen, so that now I could pack these things away myself. 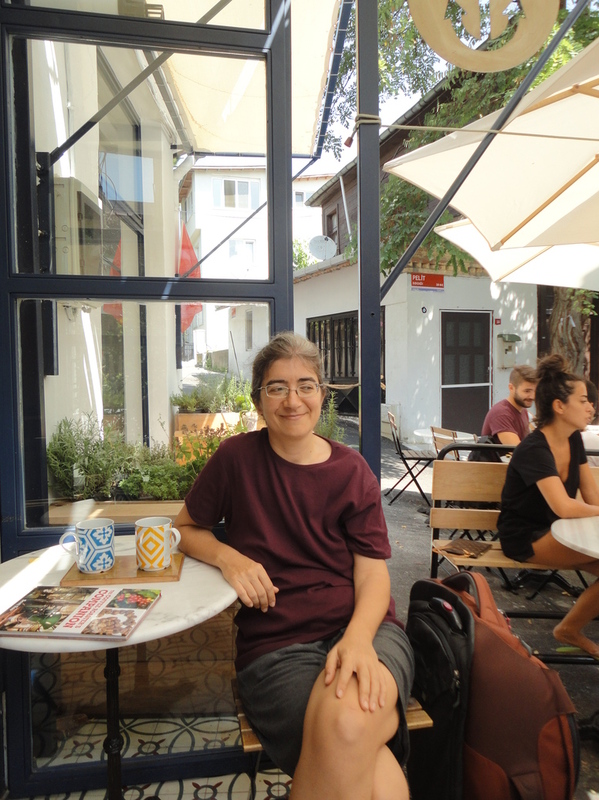 Ayşe and I had some sleepless nights, from nerves over the home invasion and sweat from the heat of Istanbul. 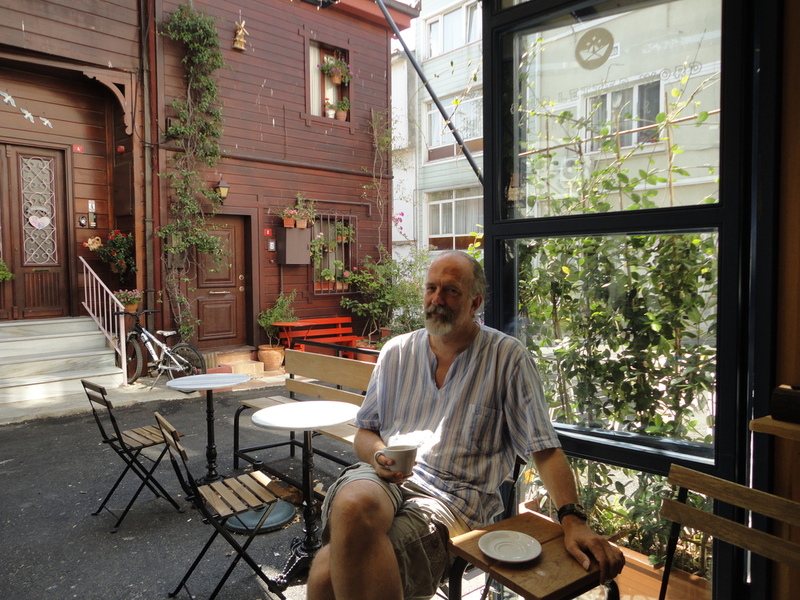 Possibly my coffee consumption had been high as well, or high for me: one serving a day, but the servings had been in commercial establishments like Starbucks, where I had sought (and found) a quiet cool place to do mathematical research. At least the research was successful: I managed to position a certain complete theory within the geography of all complete theories. There was another source of unease: the state of emergency in the country. Though foreigners like me were allowed to go on holiday, domestic university workers like my spouse were not. We expected permission to be granted soon, but this could not be certain till it happened. Meanwhile, since Burgazada was technically a part of Istanbul, we could go there legally, thus escaping the overturning of our flat. I actually skipped coffee on Monday. Still I slept maybe four hours that night, and afterwards felt energized. The workers did not show up on Tuesday morning as early as promised, so we could not catch the 9:30 ferry; we had to cool our heels and take the 10:30. Once we were on board, release started to come. The gentle rocking made my eyes heavy. Nearby in the cabin, a boy rested his head on his backpack, which was propped against the armrest of his bench. A woman gave the breast to her baby, while the spouse held up a modesty screen. 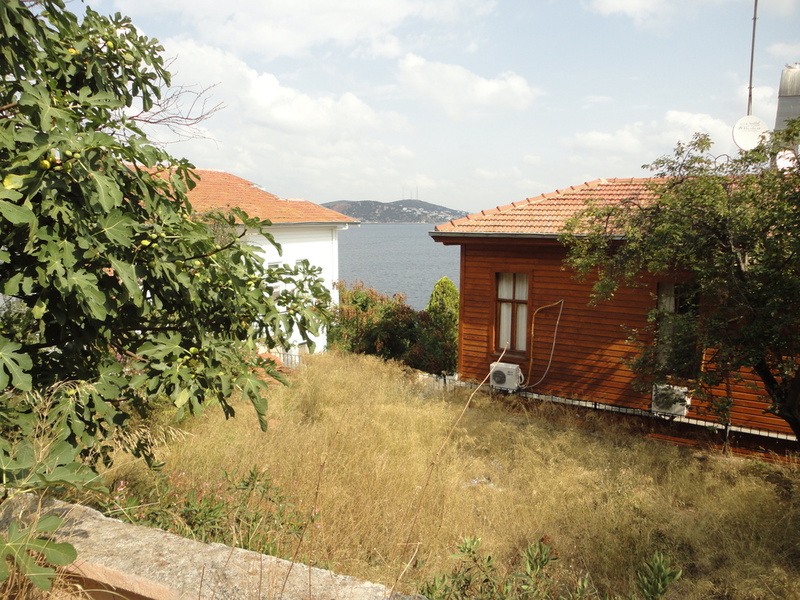 On the island, we had a room in the Teachers’ Lodge (Öğretmenevi). Staying there in 2014, we had been obliged to take the suite on the top floor. This time we had a small double room. It sufficed for us, but did prompt the question of whether people who run hotels ever test out their rooms. Chairs have been used since antiquity for purposes other than sitting. According to the story in Herodotus, when King Candaules of Lydia wanted to show off his wife’s form to his bodyguard Gyges, he hid the man behind the bedroom door; but first he pointed out the chair where his wife would lay her clothes as she disrobed. Chairs are useful that way. Are they useful for wet towels? 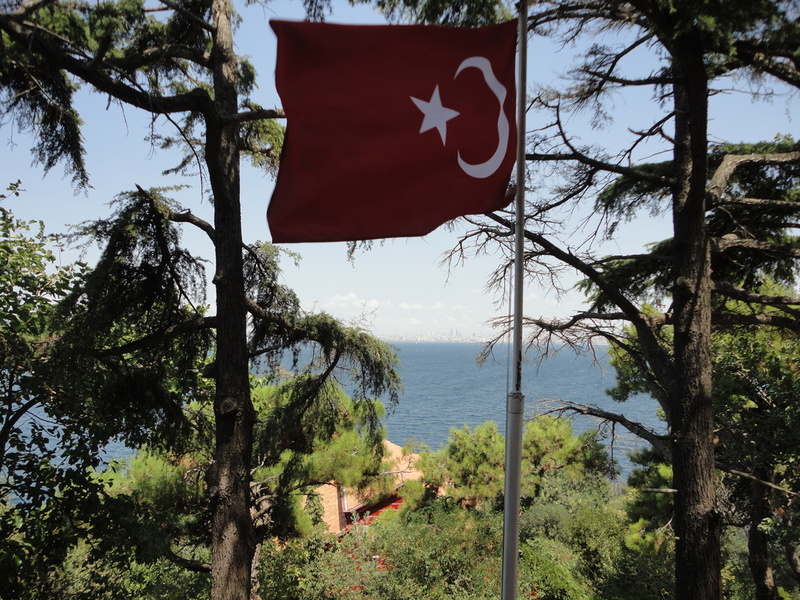 It did not matter for us in Burgazada: our room had no chair, nor any proper towel rack, but a single hook in the bathroom wall. We could use the coathangers in the freestanding wardrobe, which covered part of one window. The other window opened onto a retaining wall. For once we might have watched TV, to catch the Olympics; but the cable connection did not seem to work. Complain, complain! It is easy to do that in Turkey. 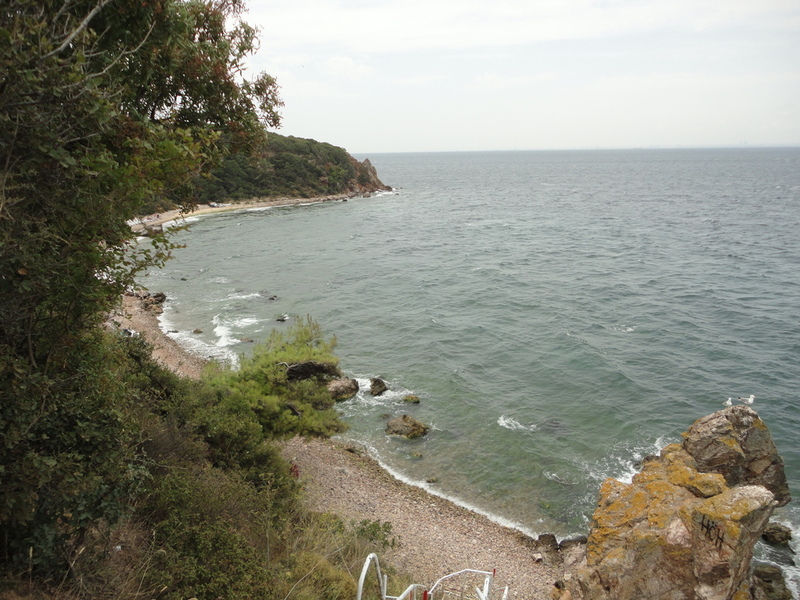 I have complained about the cramped conditions on a yacht tour of isolated Aegean coves. It should be just as easy to recognize that there are better things to do than complain. 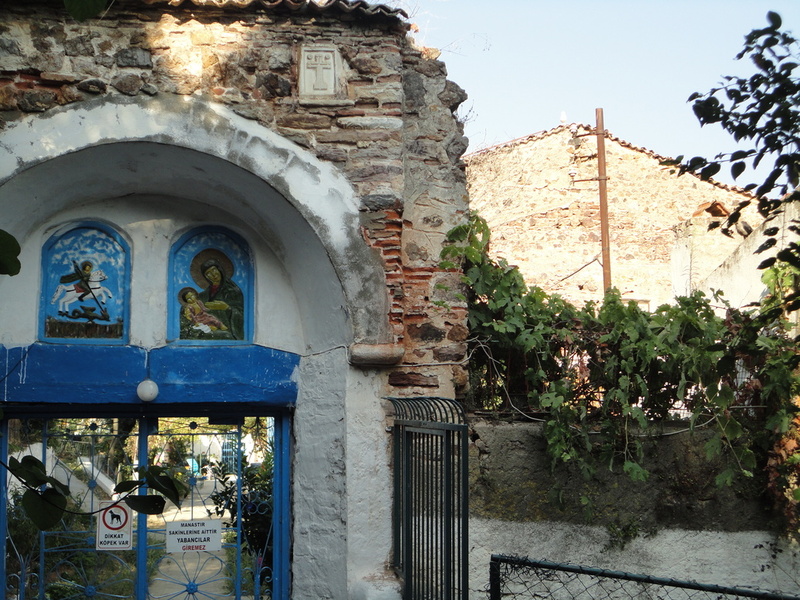 On Pyrgos Island, we were as far as possible from the crowds and concrete of Istanbul, even though we were but an hour away by ferry, and still within the nominal city limits. 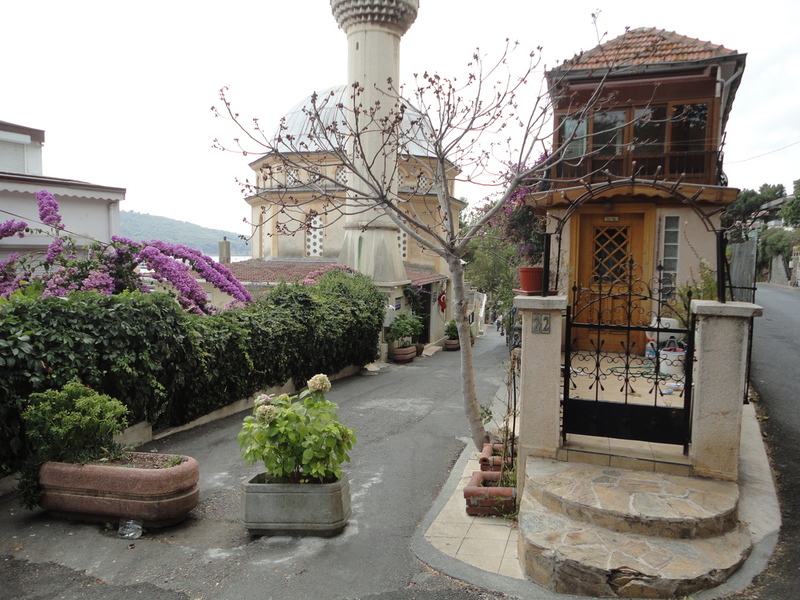 Around mosques in Turkey, there seems to be a buffer zone, within which alcohol is not to be sold or consumed. 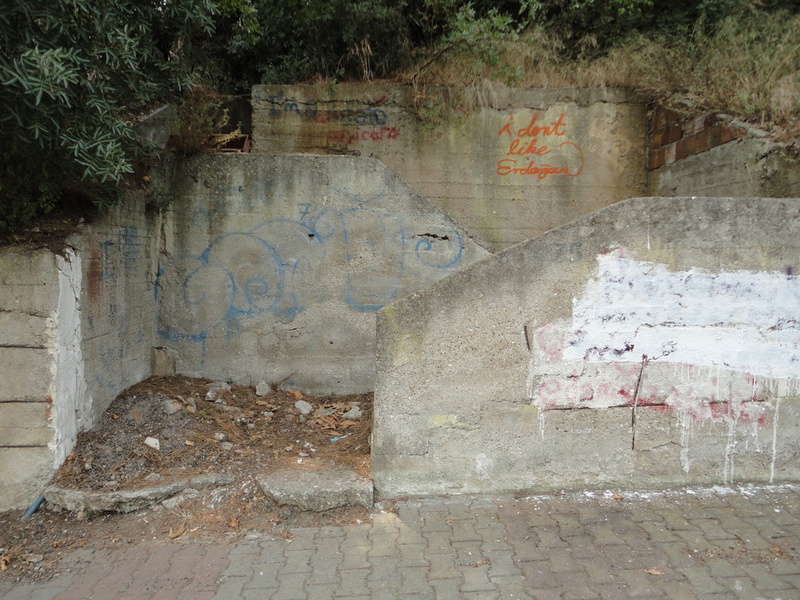 The zone around the Burgazada mosque is thin. 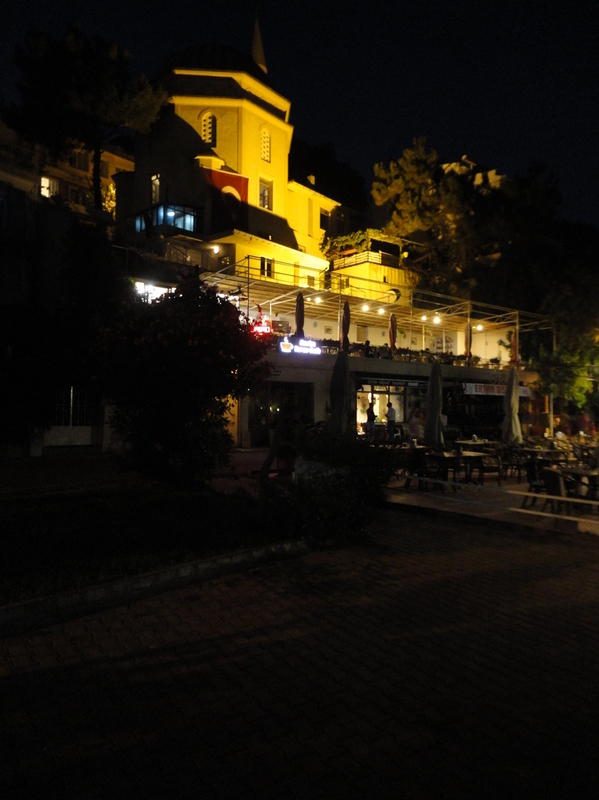 On Tuesday night we dined on meze and rakı by the water’s edge, in the shadow of the mosque, at a restaurant that we liked called Yasemin (Jasmine). There we chanced upon one of our old students, who had graduated in June. She was at a long table set up for a birthday dinner. We would see the table fill up with well-dressed young people, their faces sometimes lit up by their mobiles as the sky dimmed. 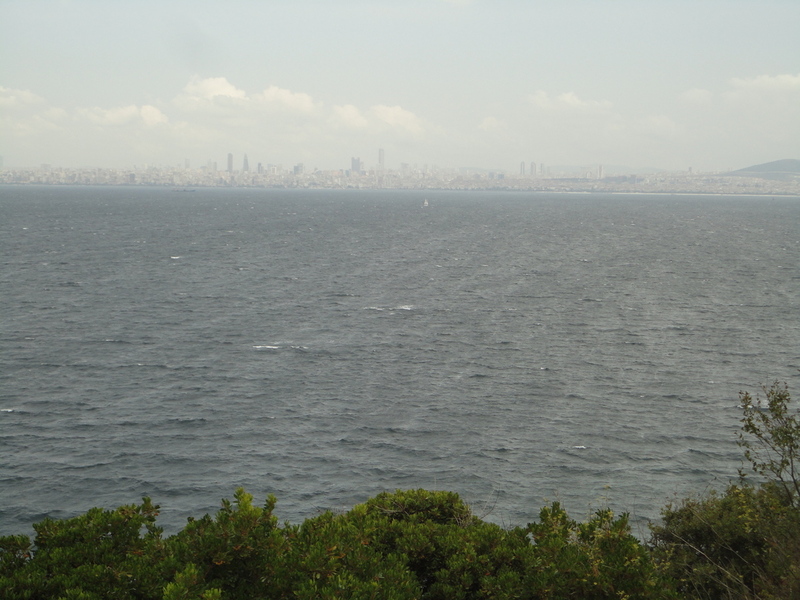 Our student’s family had a house on Kınalıada, the next (and last) island towards Istanbul: if she stayed out too late for the ferry, she could take a sea taxi home. 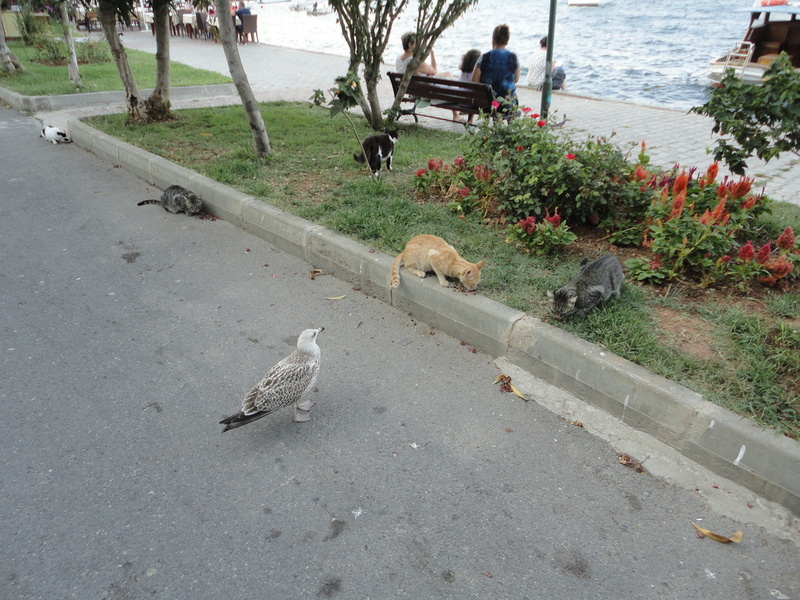 Burgazada has as many cats as any other part of Istanbul. I don’t like reggae; I love it! Around the dock we had seen young people with sleeping pads tied to their backpacks. The island has beaches where one can camp out. The road does not actually go around the island; it stops at Kalpazankaya, Counterfeiter’s Rock. Presumably this was where a certain illegal business was once transacted. 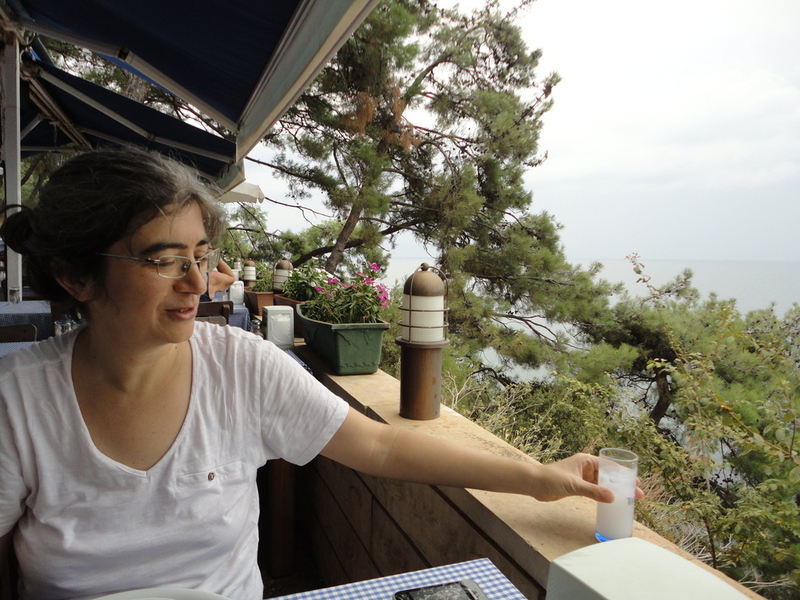 Today there is a restaurant, where for our Wednesday lunch we again had meze and rakı. 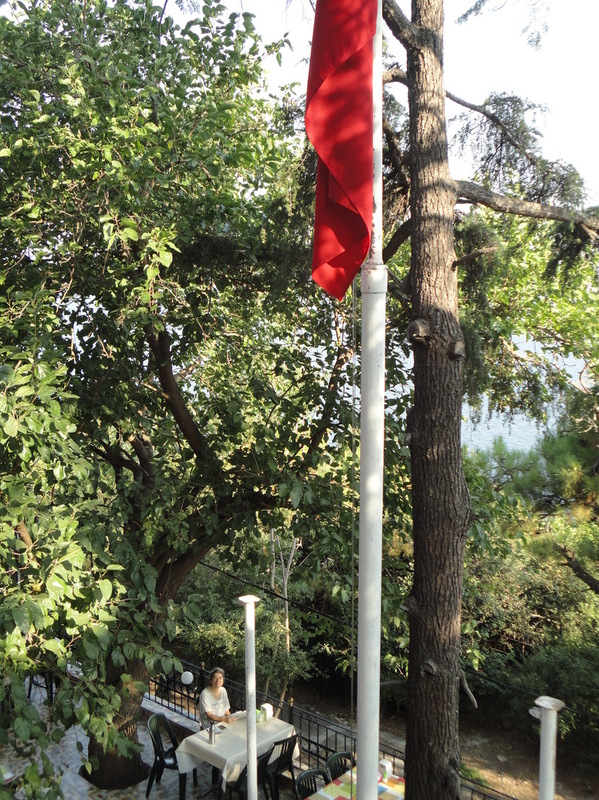 We couldn’t dawdle though; the tandır got fired up with a load of wood from old pallets, and the wind blew the noxious smoke down around the dining tables. 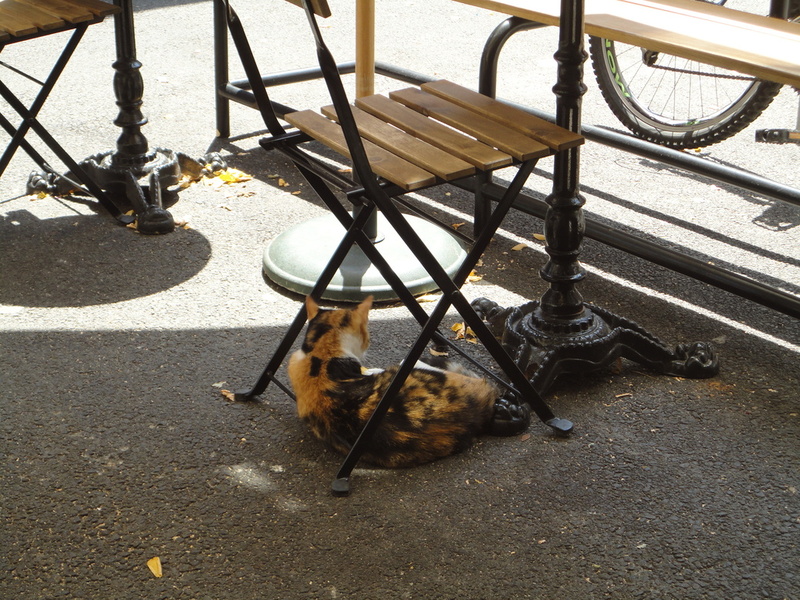 The few other customers did not seem bothered; but we moved to a table that was less smoky, then left when our repast was over. 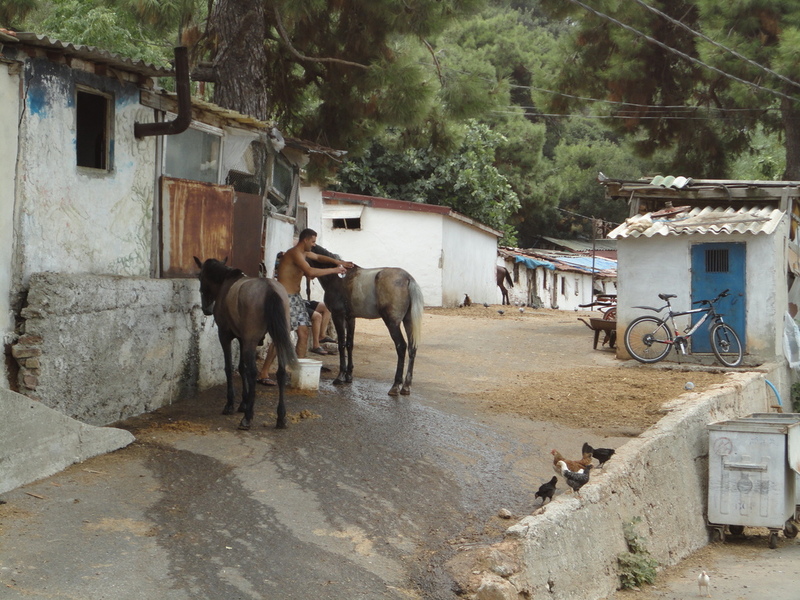 The road passes the stables where the horses drawing the island’s phaetons are kept. One can smell the stables before seeing them. Through the trees, one could see tents on the shore. To my mind, a photograph of the scene shows the importance of verbal explanations. We walk around these gorgeous places, and sometimes we take snapshots; but it needs imagination to make sense of them. When I was growing up, there was a Keep America Beautiful campaign, which included the 1971 Crying Indian television spot. The narration included the words, People start pollution; people can stop it. Either we have not had such a campaign in Turkey, or it has not been very effective. 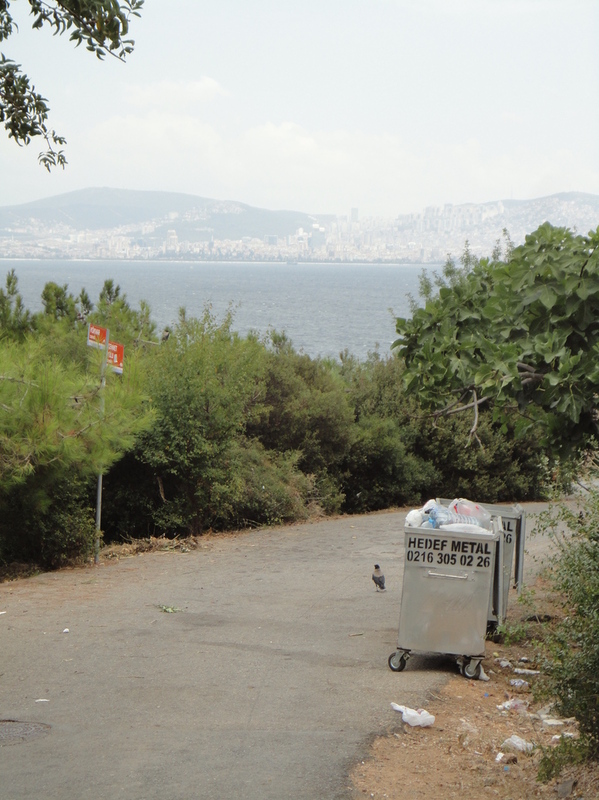 All trash on Burgazada comes from products brought over by ferry and carried further by foot or phaeton. People could take their trash back to the ferry the same way; but usually they don’t. A conventional diesel-powered garbage truck comes over by ferry to make the rounds. 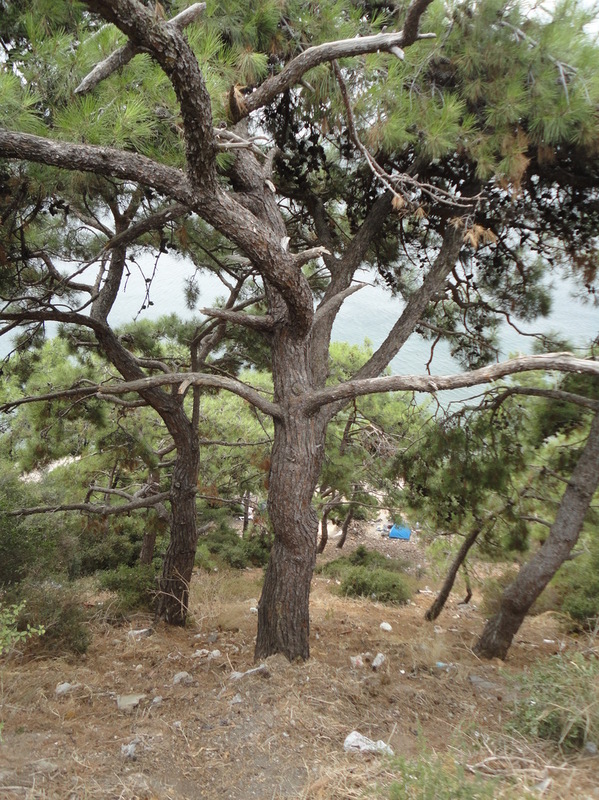 Still, on our walk to Kalpazankaya, we passed three schoolchildren, one of whom carried an empty disposable water bottle. I watched for him to toss it aside. He did not do it. He crushed the bottle in his hands, and the cap flew off. He picked up the cap. Progress is possible. Looking out over the water, one cannot forget what one is escaping from. 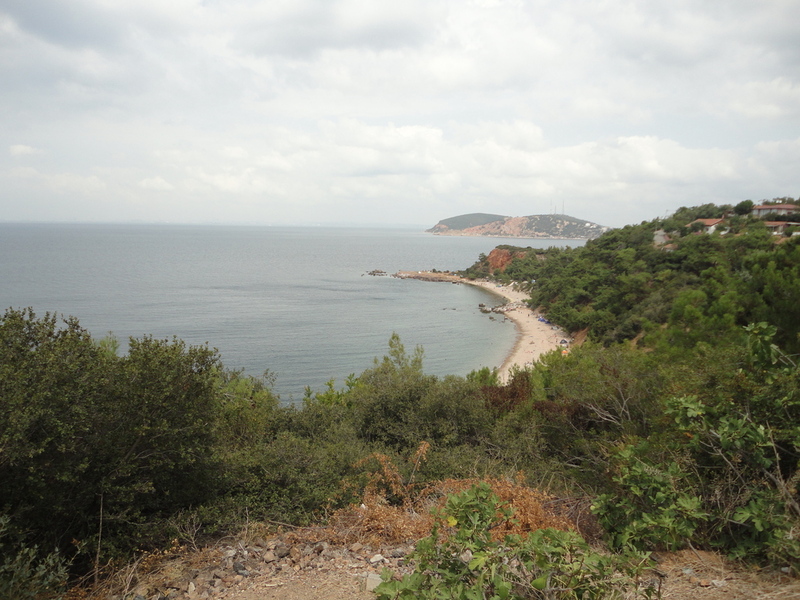 At the head of the trail down to one beach, a hand-lettered sign advertised the availability (for a price) of şezlong, or what some people in America call the chase lounge. 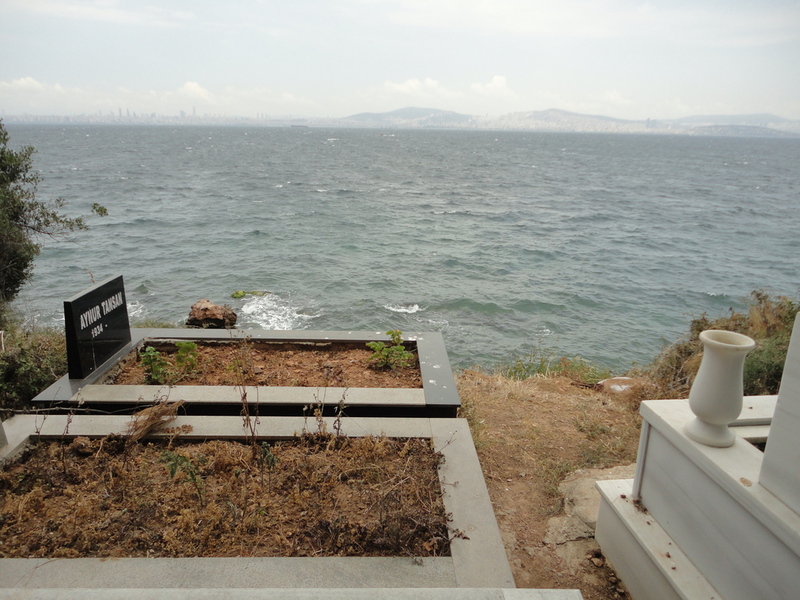 In the old Muslim cemetery, graves reached the water’s edge. On previous visits we had seen the new Muslim cemetery near the peak of the island; the Christian cemetery was at the peak. 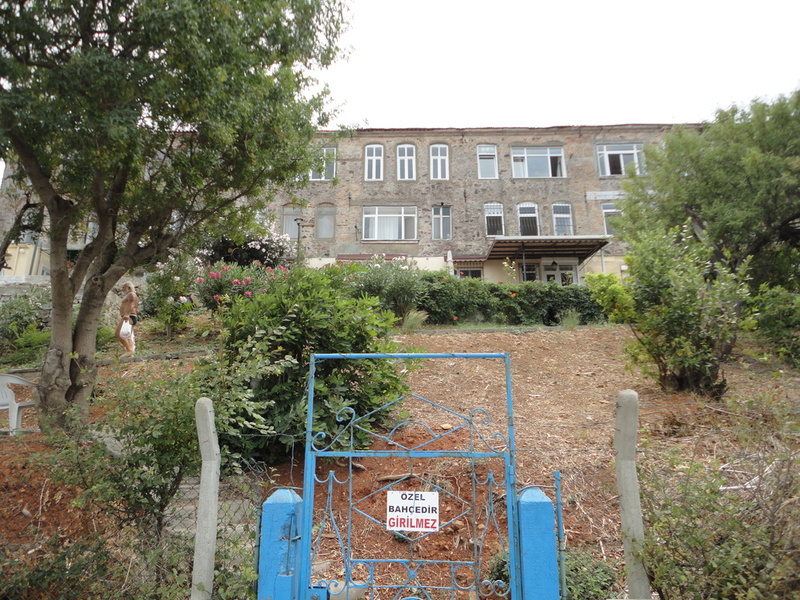 There is a building on the island called monastır or monastery. It must not be that any more, but it is still in use; I do not know whether the ownership continues to be Christian. As we reached the dock, we passed a couple of backpackers, who were shaking meals onto the ground from a box of cat food. One nervy seagull was able to grab a morsel or two for himself. 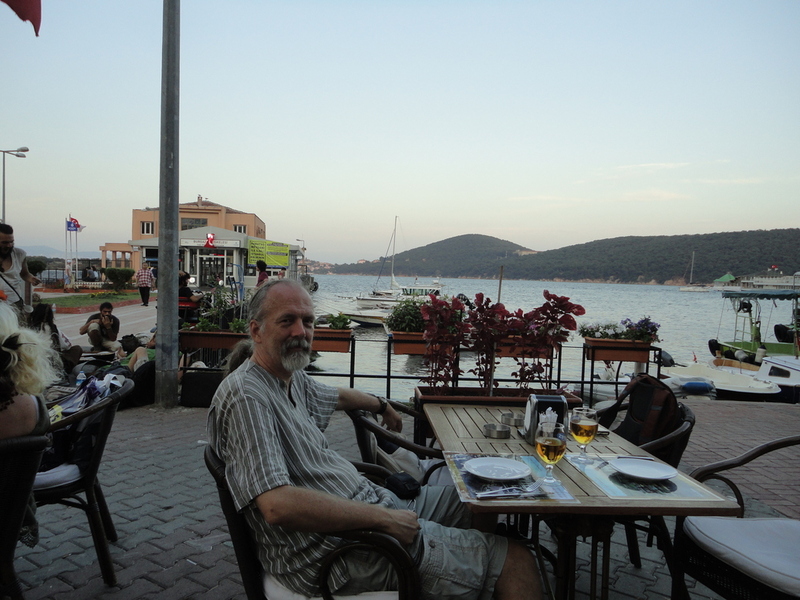 For our Wednesday evening meal, instead of meze and rakı, we opted for pizza and beer. There were not too many alternatives for the vegetarian. I am going, day and night. The complete lyrics are quoted in the poet’s Wikipedia article. For the players, we left alms equivalent to the cost of a pizza. We listened till the band ran to the ferry. 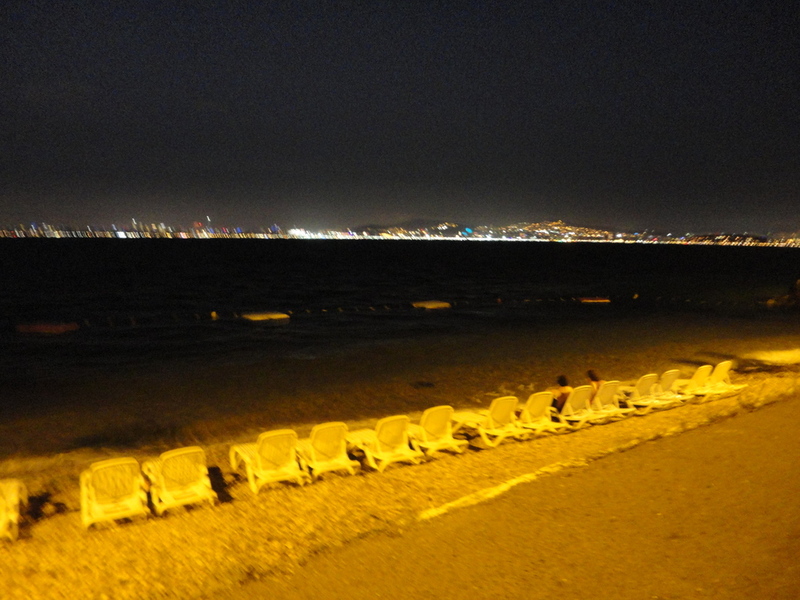 Then we strolled on the road along the shore, past Yasemin and the mosque. A flock of seagulls roosted uneasily on a sandhill, shifting position as a cat sauntered among them. 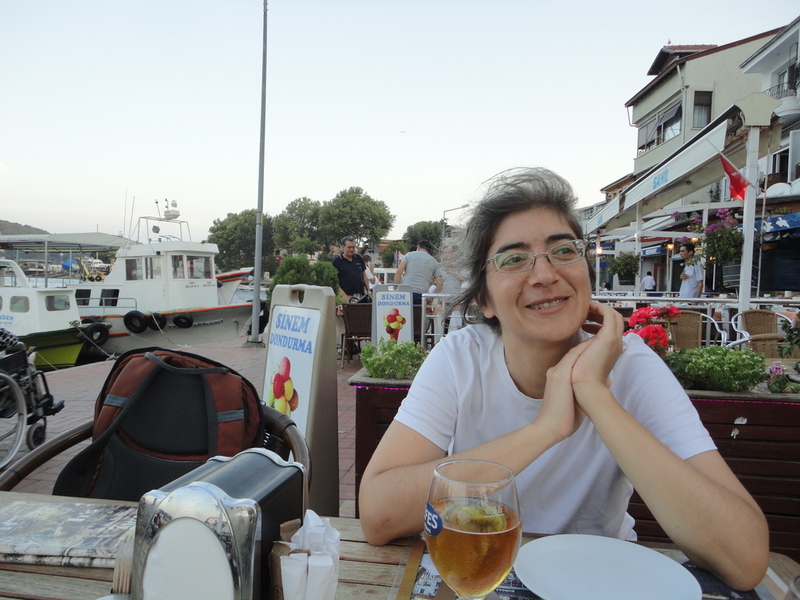 Two women sat drinking beer in a row of şezlong. Eventually the road joined the main road, and we circled back to our guesthouse. Along the way, we passed a white church. 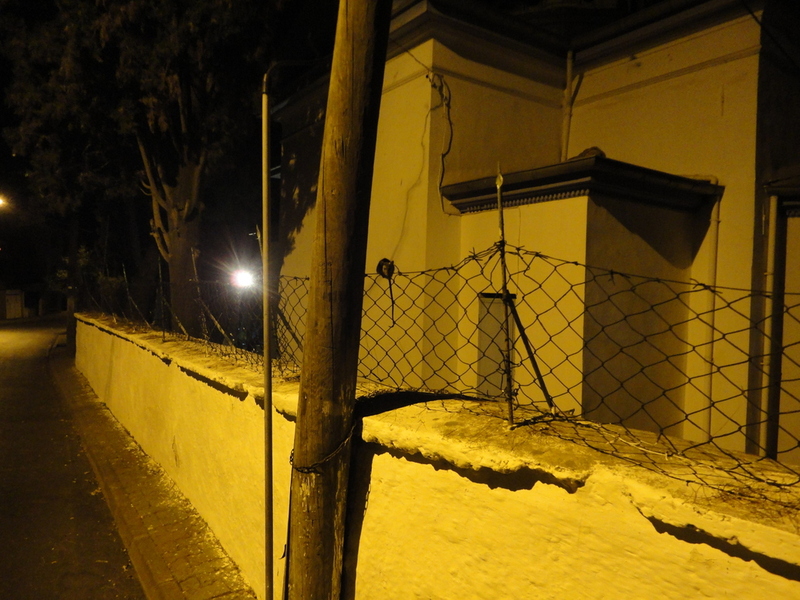 A rat ran along the top of the wall, then paused. The cats may be too well fed to chase rats. I saw the sun rise Thursday morning. A few people were out on the road, even at six o’clock. Perhaps they were catching an early ferry to jobs in town. Ayşe joined me around eight o’clock. Breakfast was not served till nine. 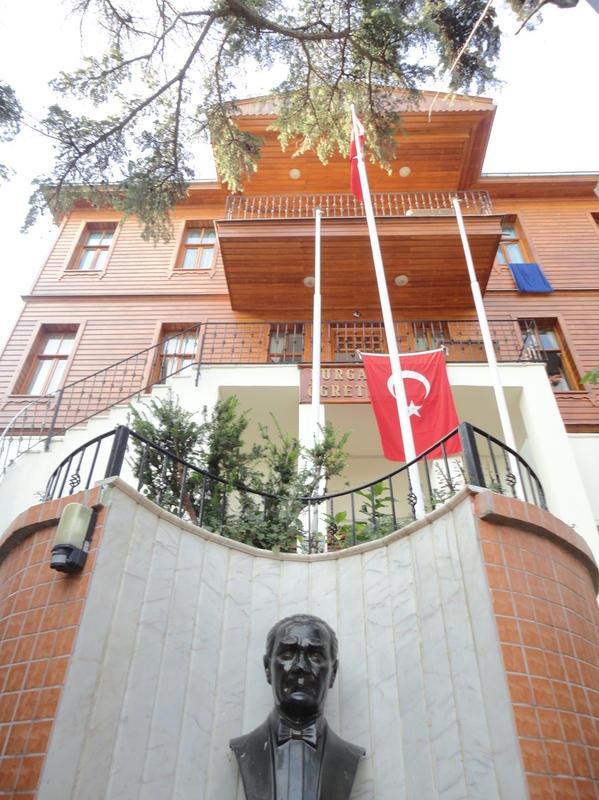 Being a state institution, the Teachers’ Lodge featured monuments to Atatürk. Teachers, he says here, the next generation will be your work. 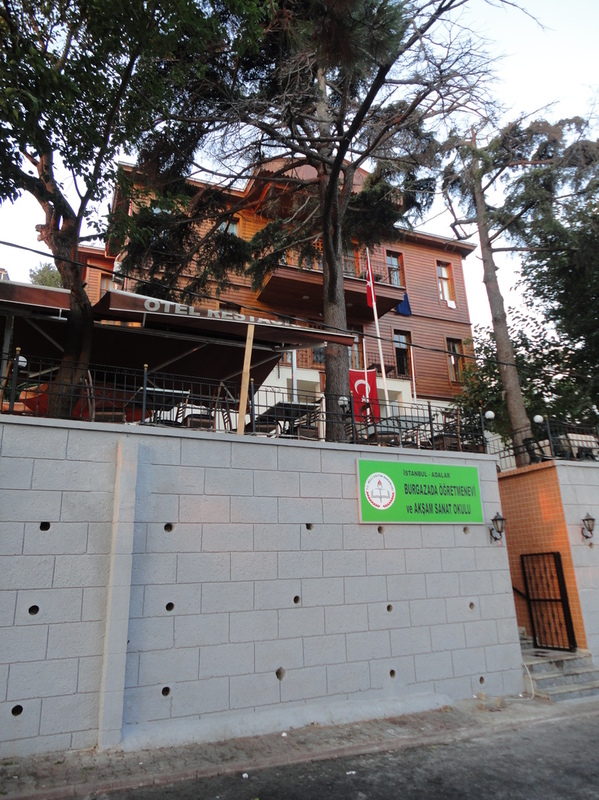 Current troubles in Turkey may be traced to two conflicting views of education, both of them wrong. One is that doctrinaire religious instruction is the best education. The other is that technical education is important, but only for the purpose of running the state according to the principles of a supreme leader. 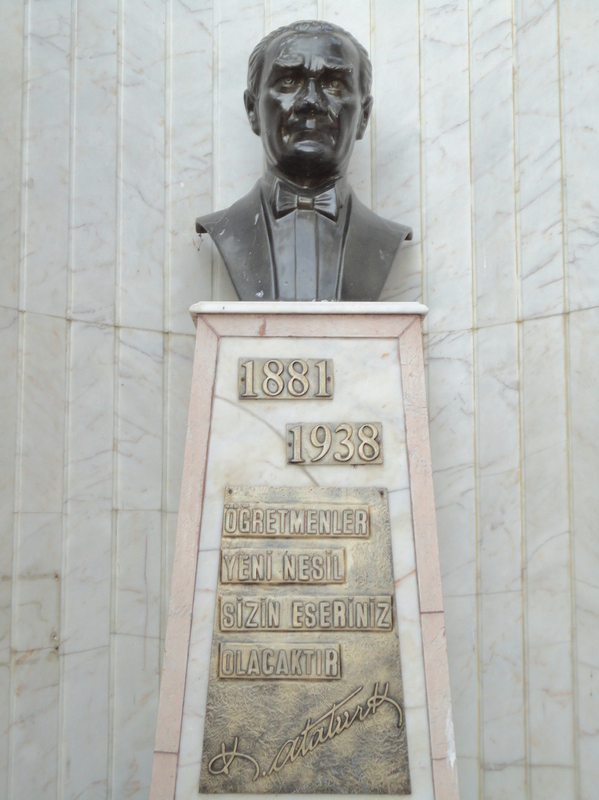 One may criticize Atatürk’s ideas of education as well, and I have done this elsewhere. But these days, I think criticizing Atatürk is like criticizing Hillary Clinton: there may be more urgent concerns. 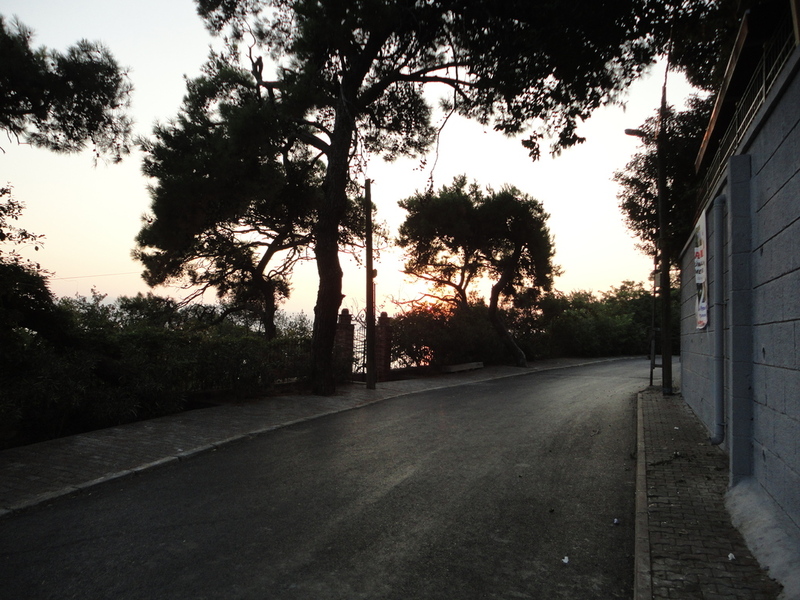 Below the Teachers’ Lodge, a side road angles away towards the shore. Visitors taking that road had been warned that it was a dead end, but they had said they wanted to see the monastery gate. On Thursday morning, I went to see it for myself. The sign says, [This place] belongs to the monastery residents. Outsiders may not enter. Above are St George and a Madonna and Child. We had a last coffee at Four Letter Word. By now, the city was but a distant memory. Then we caught the 10:40 ferry back to it. Our flat was a mess, with dust everywhere. Several of the plastic sheets that we had bought had gone unused. But an afternoon of labor brought things back down to our usual level of filth. This entry was written by David Pierce, posted on August 12, 2016 at 7:43 pm, filed under Istanbul, Nature, The Islands, Turkey and tagged 2016. Bookmark the permalink. Follow any comments here with the RSS feed for this post. Post a comment or leave a trackback: Trackback URL.